Known previously only from Guam. See Scott Johnson's record below from Marshall Ids. UPPER: 64mm, Guam, Annae Is., 8m, 27 April 1969. LOWER: 49mm, Guam, Bile Bay, 14m, 24 April 1991. PHOTOS: Clay Carlson. One of a group of white species of Halgerda with orange markings. This species is characterised by the orange-tipped tubercles, a sparse network of orange lines on the dorsum between the tubercles, and thin submarginal orange lines around the mantle edge. Known only from Guam. 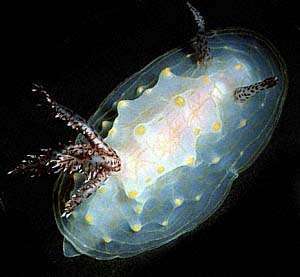 There are three species of Halgerda with a network of orange lines. In H. malesso the network of lines sometimes fuse to form orange patches in the depressions, there are multiple fine orange lines around the mantle edge, and the fairly high tubercles are capped with orange. In Halgerda batangas, which also has a network of orange lines, the ridges and tubercles are low and rounded. The tubercles are capped with orange-red with a basal ring of white. The edge of the mantle is white with orange-red tubercles. The foot is edged with orange. The third species with an orange network is Halgerda terramtuentis. It has golden orange lines and the tubercles are capped with white. • Carlson, C.H. & Hoff, P.J. 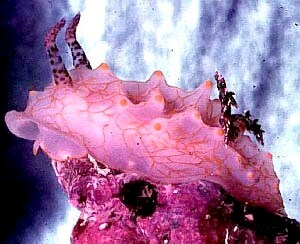 (2000) Three new Pacific species of Halgerda (Opisthobranchia: : Nudibranchia: Doridoidea). The Veliger, 43(2): 154-163.